If you’ve taken an avalanche safety course—and if you haven’t, you should consider it—then you likely have it hammered into you’re brain that you must be constantly vigilant to changing conditions, gathering observations, watching for red flags and always, always working toward good communication within your group. Understanding the current level of risk related to avalanches should be paramount before, during and after your backcountry trip, but knowing what else to look for besides what’s in the bottom of a snow pit can be complicated. Here are a few things I take into consideration before I hit the skintrack. Determining the avalanche problem of the day and how to manage it can be more important than simply knowing the avalanche danger rating posted on the morning’s avy forecast. If I’m looking at a persistent slab problem, I’m mostly thinking about avoiding avalanche terrain. If I’m worried about wet avalanches, I know my timing is paramount. Storm slabs? I can look for new snow depths and bonding. Knowing that the danger rating is considerable or high is important, but understanding why will let you plan a route, whether that’s through the steeps, trees or low angle meadows on really touchy days. Do you know how long it will take you to complete your tour? Have you planned extra time for unforeseen events? If you decide to grab another lap, you need to pay attention to when the sun sets so you can give yourself a proper buffer for when/if something unexpected happens. A simple formula can give you a good idea of how long your trip might take. Generally speaking, people climb skintracks at a rate of 800- to 1000-feet-per-hour and travel somewhere between three and five mph in the flats. Conditions, fitness and size of group all come into play on this calculation and you should factor in 15 minutes for breaks and discussions every hour and a half-hour lunch break for an all day tour (on those sunny days). You can use this to get a rough idea of how long a tour will take, or how much time you need to bang out another lap. Powder can be a powerful temptation, but remember to properly weigh the risks of another run with the reward of a cold brew and a warm house at the end of a day. I tend to plan to be back at the trailhead an hour before dark at a minimum and always pack a headlamp just in case. If you need help with these calculations, check out the app Guide Pace for slightly more advanced techniques. Prepping for dangers that may lie ahead takes a lot of the stress and decision making out of a day of touring. Do you need a rope, map, compass and GPS for navigation? How about crevasse rescue equipment if you’re traveling in glaciated terrain? While I am not often skiing in terrain where a rope is mandatory, there are many times when I carry it “just in case.” Maybe conditions are thin or I sluffed out the entrance of a line. If that’s the case, a little hand line around a tree will be helpful in descending to a point where I feel more comfortable skiing. A rope is also super helpful if someone gets hurt and you need to improvise to get them out. A bluebird day in the alpine can rapidly develop fog, which would make travel without a navigation device almost impossible. Knowing how conditions may change during the day is relevant for avalanche conditions on both storm days and in periods of rapid warming like spring, but can also affect the timing and enjoyment of your tour. I’ve been stymied in my plans when clouds roll in and hot pow turns into breakable crust in a matter of minutes. Needless to say, that can mean you get home far later than anticipated after having made survival turns for hours on end. Other times, I’ve neglected to time where the sun may hit the slope and have ended up with afternoon flat light in the alpine, which makes visibility very tricky and potentially dangerous with end-of-day fatigue. Bad things happen in the backcountry at some point. Granted, there is a variable scale of “bad, ” from your snowmobile breaking down or the heelpiece on your touring binding falling off, to something worse like a blown knee or, God forbid, an avalanche. But even small problems can cause some serious strife. You need to ask yourself if you can you fix a binding it with the contents of your repair kit or fashion a rescue sled if someone tweaks a knee. Being prepared can take forethought, but in the event of an emergency, it can make a life-threatening situation more manageable. Knowing how your group collectively feels on the skintrack is an important and often overlooked aspect to backcountry safety. If some of your group members indulged a little too much the night before, the next day’s pace may create problems over the course of a few hours. Tired and hung-over people tend to be poor decision makers. Another safety concern can be having novice backcountry riders in the group. 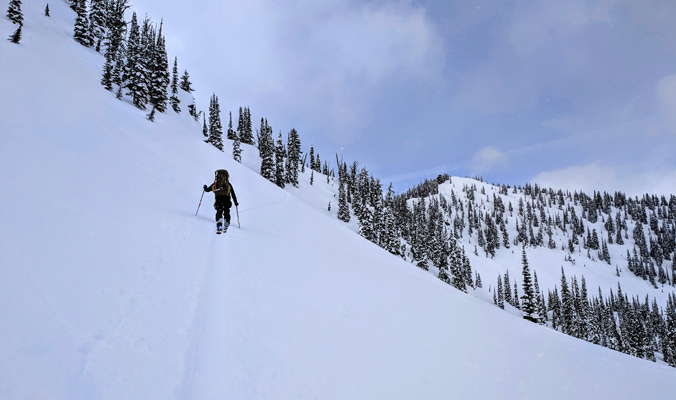 There is nothing wrong with helping your friends get into backcountry skiing, but be aware that the day’s objectives will have to be tailored to them, not you—keep the couloir shredding to when you go with your more experienced buds. Bottom Line: When I’m preparing for a backcountry tour, I try to consider everything that could change my plan. Of course we can never foresee the unforeseeable, but if we pause to think about potential hazards and problems, we can be ready when little hiccups occur and can be efficient when presented with bigger setbacks.